It's easy to build a nestbox for kestrels. I thought about that for a minute and then had to answer “no” to both parts. 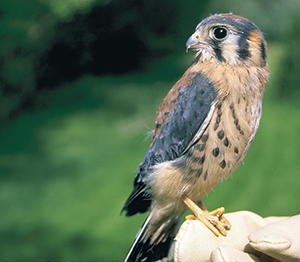 Kestrels, also known as sparrow hawks, are the smallest of the falcons found in Utah. These colorful predators prey on grasshoppers, other large insects, mice, voles and the occasional small bird. They like to perch on fence posts and telephone wires and used to be found anywhere there was an open field. Now is the perfect time to build and install a kestrel nestbox. Watching these birds hunt and raise their young has provided me with hours of fun. My first memory of kestrels was a pair that hunted the open field next to our house. Our wooden fence and the porch rail made excellent perches. It wasn’t uncommon to look out our window and see the male eating a grasshopper or watching the sparrows attracted to my mom’s bird feeders. There was another pair that hunted an abandoned housing development below our house. We never found their nests or aeries, which in hindsight was likely a good thing. My older brother and his friends wanted to capture them so they could be falconers. It seemed like everywhere we went, these colorful falcons were there, hovering above the ranches to the east, hunting the open sagebrush steppe to the west and perching along the forested foothills north of our house. A kestrel in its nestbox. Photo via woodlandhabitat.com. When I moved to Utah, the story was the same; there were kestrels within blocks of where we stayed. I’ve located several nests over the years and enjoyed dropping by for a visit to see how they were doing. My wife and I even raised several chicks that were brought into the office when their trees were cut down. Research data from national, state, government and public bird surveys collectively indicate that the Southern Rockies/Colorado Plateau area (roughly the eastern half of Utah, western Colorado and northern Arizona/New Mexico) has about a 64 percent decline in kestrels since 1966. The eastern half of the state, part of the Great Basin region, has done better but it still has a 36 percent decline. Research data also shows there are numerous reasons for the declines, but they can all be summed up by one word: civilization. Ironically, civilization likely helped boost kestrel populations initially as small farms and ranches increased the size and number of small, productive open spaces. Irrigation brought in more plant growth for insects and trees growing along the banks of the canals and planted for windbreaks provided nesting sites. Today, many of the open fields and trees have been replaced by cities, but there is some good news. There are unused spots even though there are still open fields. Kestrels aren’t using these places (or not using them to their potential) because they lack places to nest. Kestrels mate in early spring. Once a pair has courted, they look for a suitable nest site, usually a hole in a tree. Kestrels are cavity nesters and old woodpecker holes are perfect. 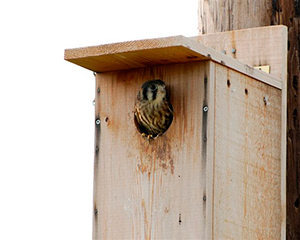 That’s the good news: kestrels will readily nest in a 10″x10″x15″ wooden box, so cavity nests are easy to build. Place a box in the appropriate habitat and the kestrels will likely do the rest. You can find instructions on building and installing a kestrel nestbox on The Peregrine Fund’s American Kestrel Partnership website. Check out the rest of the website for more information on kestrel biology and habitat preferences. It’s a great resource. Once the nestbox is built, mount it on a post or tree trunk roughly 10 feet above the round and next to an open field, preferably one with a good, clean water source nearby. Multiple nestboxes can be placed about every half-mile. Building these boxes makes for a good family or scout activity. Kestrels will be looking for nests until early-to-mid April, so here’s your opportunity to do something special for wildlife. << (Previous) How do I catch those burbot? Hogle Zoo has several Kestral Boxes available (free of charge) for parties interested in becoming part of the kestral box projet. Interested parties may call 801-584-1714 for more information. The nesting box looks very similar to the wood duck box. Most Fish and wildlife agencies have them for free.